Frederick George Jackson (born February 20, 1981) is a former American football running back. He played college football at Coe College. After going undrafted in 2003 and playing three seasons in NFL Europe, Jackson spent nine seasons with the Buffalo Bills, becoming their third all-time leading rusher. In 2015 season, he was the oldest active running back in the NFL. Also a standout sprinter, Jackson was a state-qualifier in the 100 meters and recorded a time of 21.78 seconds as a member of the Lamar 4 × 100 m relay squad, breaking the previous record. After trying out for the Chicago Bears, Denver Broncos and Green Bay Packers, and being seen as too small a player for the National Football League (NFL) at 6'1" but only 195 lbs, he went on to play indoor football for the Sioux City Bandits where he earned $200 a week, and an additional $50 for a win. Jackson played two seasons for the Bandits in the National Indoor Football League (2004) and United Indoor Football (2005). He was named the 2005 UIF co-MVP in 2005; in 18 games he ran for 1,770 yards and scored 53 touchdowns (40 rushing, 11 pass receiving and 2 on kick returns). During this time, he also worked as a youth counselor at Four Oaks to make ends meet. His jersey number was retired by the Bandits in 2008. Jackson was invited to training camp with the Buffalo Bills in 2006 by Bills general manager Marv Levy, a Coe College alumnus himself. He made his first career start against the Washington Redskins in 2007, rushing for 82 yards while catching four passes for 69 yards in a Bills victory. He became the first Division III running back to start an NFL game since December 24, 2000, when former Ferrum College running back Chris Warren started for the Philadelphia Eagles against the Cincinnati Bengals. In 2010, after winning the starting job from Lynch in Week 12, Jackson eclipsed the 1,000-yard rushing mark for the first time in his career with 1,062 yards and 2 touchdowns. He also set a career-high in catches with 46 for 371 yards and 2 more scores and also completed a 27-yard touchdown pass. Jackson also had 1,014 kickoff return yards making him the first player in NFL history to compile 1,000 rushing and 1,000 kickoff return yards. The 2,516 combined yards are the fifth highest all-purpose yards total in NFL history. In Week 17 of the 2009 season, versus the Indianapolis Colts, Jackson had a career day with 212 rushing yards and a receiving touchdown. After spending the 2016 season out of football, Jackson announced an attempt at a comeback by signing with The Spring League, a league formed from the remains of the former Fall Experimental Football League, for its summer 2017 showcase. In April 2018, Jackson confirmed he was in talks with the Bills to sign a one-day contract and formally retire as a member of the team. The contract was signed, and Jackson subsequently retired, on April 18, 2018. During the 2009 season, Jackson became the first player in NFL history to compile 1,000 rushing and 1,000 kickoff return yards during one season. On October 20, 2015, it was initially reported that a drag race just outside the Seahawks' training facility between Fred Jackson and teammate Marshawn Lynch ended with Jackson crashing his Corvette, first into a planter box and then a stop sign. However police later denied the report and said he was simply driving too fast. Jackson had his own television program airing on WBBZ-TV. The Fred Jackson Show aired Mondays during football season. It debuted on September 10, 2012, and ran for Jackson's last three years in Buffalo. In 2018, Jackson signed with MSG Western New York to be an analyst for its weekly postgame series, Bills Tonight. Along with fellow Bills alumni Brian Moorman and Terrence McGee and other prominent Buffalo figures, Jackson operates SEAR, a high-end steakhouse located within The Avant in downtown Buffalo. ^ "Fred Jackson NFL Football Statistics". Pro-Football-Reference.com. February 20, 1981. Retrieved December 25, 2012. ^ Fairburn, Matthew. "Fred Jackson, the NFL's oldest running back, wants to play 3-4 more seasons". Syracuse.com. Advance Digital. Retrieved September 7, 2014. ^ "Fred Jackson". trackingfootball.com. Retrieved November 15, 2015. ^ MJD. "Jerry Jones built Cowboys Stadium on Fred Jackson's old house - Shutdown Corner - NFL Blog - Yahoo! Sports". Sports.yahoo.com. Retrieved December 25, 2012. ^ "Fantasy Football Breaking News". Rotoworld.com. Retrieved December 25, 2012. ^ New record was set in 2011, Pro-Football-Reference.com: For single seasons, from 1920 to 2011, sorted by descending All-Purpose Yds. ^ Galliford, Brian (January 5, 2010). 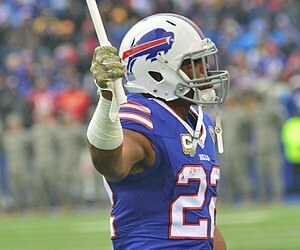 "Putting Fred Jackson's 2009 season in perspective". Buffalo Rumblings. Retrieved December 25, 2012. ^ "Player Game Finder Query Results". Pro-Football-Reference.com. Retrieved November 15, 2015. ^ Weisman, Larry (January 22, 2009). "Annual All-Joe team: Honoring those who won little acclaim". USA Today. ^ "Fred Jackson of Buffalo Bills rewarded with contract extension - ESPN". Espn.go.com. May 7, 2012. Retrieved December 25, 2012. ^ "Buffalo Bills release longtime running back Fred Jackson". SB Nation. Retrieved August 31, 2015. ^ "Buffalo Bills Career Rushing Leaders - Pro-Football-Reference.com". Pro-Football-Reference.com. Retrieved November 15, 2015. ^ Rosenthal, Gregg (September 4, 2015). "Fred Jackson agrees to contract with Seattle Seahawks". NFL.com. Retrieved September 4, 2015. ^ Wawrow, John (April 18, 2018). "Fred Jackson cherishes chance to retire with Buffalo Bills". AP News. Retrieved April 18, 2019. Jackson had time to reminisce Wednesday upon returning to Buffalo to sign a one-day contract to retire as a member of the Bills. The formality brought closure to a nine-season NFL playing career Jackson built on both a powerful running style and sheer perseverance. ^ a b c "Fred Jackson's Wife Danielle Jackson". ^ Davis, Nate (January 28, 2010). "Joe Flacco an overachieving headliner on '09 All-Joe Team". Usatoday.Com. Retrieved December 25, 2012. ^ "Fred Jackson". NFL.com. Retrieved November 15, 2015. ^ "Fred Jackson wrecks car in reported drag race with Marshawn Lynch". NBC Sports. October 20, 2015. Retrieved October 20, 2015. ^ "Renton Police: No further investigation into accident involving Seattle Seahawks' Fred Jackson". Seattle Times. October 21, 2015. Retrieved February 12, 2016. ^ ""The Fred Jackson Show" To Return For 3rd Season". WBBZ. September 8, 2014. Retrieved October 1, 2013. ^ Pergament, Alan (August 2, 2018). "Fred Jackson to join Bills post-game show, Catalana replaced on sidelines". The Buffalo News. Retrieved August 2, 2018. ^ Warzala, Steve (November 17, 2016). "SEAR: "It's all about the sear."". Buffalo Rising. Retrieved January 1, 2019. ^ "About SEAR, local steakhouse near Buffalo, NY". SEAR Buffalo. Retrieved October 16, 2018.